I love all the analogue, in-world stuff like the maps, watches, compasses and air-pumps. I was disappointed by the “scary” action of the FEAR titles – action wise they’re fine but despite a strong scenario they just fail to build any atmosphere to speak of. The problem is that they’re trying to imitate movie techniques and in a videogame that’s not necessarily the most effective route. The movie cliches stand out from the interactive experience and end up as canned cinema sequences where you can flail around like an idiot, with the game designers behind the scenes hoping really hard you’ll look in the right direction to see the scary bit. 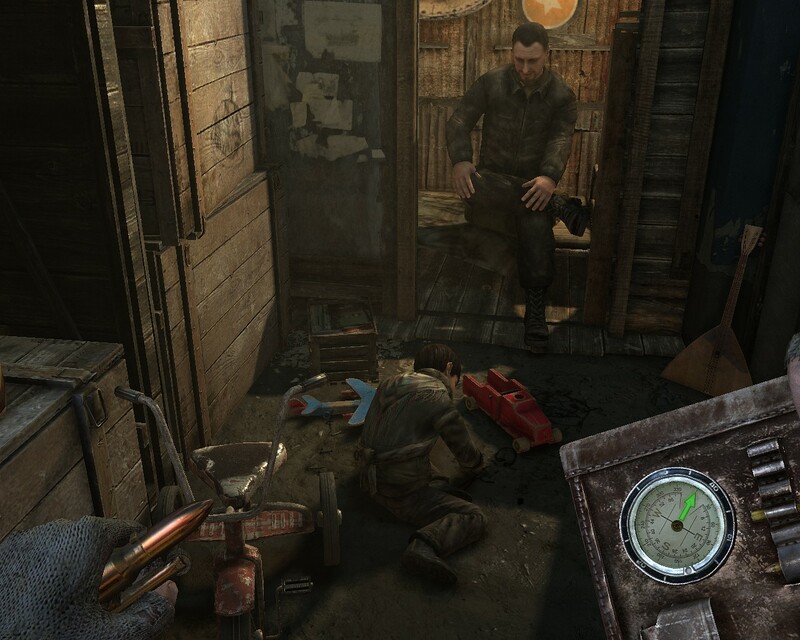 If you want to see an example of atmosphere done right, Metro 2033 is your game. I don’t much like Metro 2033 as a game. The guns feel seriously underpowered, the feel of movement and fighting is just off and everything is clunkier than I’d like. But as an experience, something you plunge into to have an intense ride in a cruel world, it shines. Without using movie techniques, it actually fills the role of a horror movie, except being interactive in a meaningful sense. The game’s structure is interesting. Instead of being a sandbox (Far Cry) or a linear rollercoaster (FEAR), it’s a bit of both, except cut up into bite-sized vignettes. You go from scene to scene, and the game often judiciously cuts right to the next interesting bit. Games rarely do this well, and it’s a joy to follow along on the ride. The first-person perspective doesn’t mean you should be forced to take every single step and be “immersed” all the time. Metro doesn’t have a story as much as a world. You’re cast into a world that you perhaps feel like you know – a post-apocalyptic underground complete with comic-book mutants – but that manages to surprise you in every turn. Some of it comes from its details – bullets as currency so you’re effectively firing money at the enemy, constantly running out of gasmask filters, the Russian vibe of the society – but mostly it’s the atmosphere. Being in this world is so oppressive, you’re thankful for the breaks the vignette structure offers. It’s oppressive in a way the ultra-violent fantasy of the Fallout games doesn’t ever reach. I had to stop playing Fallout 3 because I just didn’t want any more of the hopeless grey wasteland, but Metro manages to out-do that in every regard, yet still keep me coming back. The secret is that its threats are believable and relatable. As a movie analogy, Metro is The Road – it will make anyone quiet and relate, whereas many won’t watch a splatter movie and those that do, enjoy them for the laughs. Where Fallout shocks you with a super-mutant’s super-bag dripping with body parts and gore and eyeballs sailing through clouds of blood in (super) slow motion, Metro has you freezing and choking on polluted air, your breathing heavy and pained in the echoing gasmask you’re wearing most of the time, its cracked glass and scratches a plexiglass you’re thankful is separating you from your immediate surroundings. You’re checking your analogue wristwatch to see how much time you have left before you need to replace your mask’s filters. You’re turning over the bodies of scavengers that you haven’t killed, but who have rather frozen or starved to death on the surface. There is no music to get your blood pumping. It makes you quiet. And then, when you’re safe, Metro isn’t afraid to make humanity worth something clinging to. When you’re running with the stupidly serious, cookie-cutter soldiers of FEAR, or hanging out with the circus crowd of Fallout, being a clone amidst men doesn’t mean anything. There is nothing to relate to. Metro’s world is one of people: prejudices, injustice, children and parents, tea and vodka and getting by, sharing stories and being afraid of losing it all. I haven’t played Metro 2033 but I feel like I should now. Have you tried I Am Alive? It’s short, but from your description very similar to Metro 2033. In case you haven’t tried it, I recommend it. In case you have, how does it compare to Metro? Thanks for sharing.